Our guide to Atlanta will help you find the best bed and breakfasts in Atlanta Georgia. Atlanta's character has evolved from a mix of peoples: transplanted Northerners and those from elsewhere account for more than half the population and have undeniably affected the mood and character of the city. Irish immigrants had a major role in the city's early history, along with Germans and Austrians; the Hungarian-born Rich brothers founded Atlanta's principal department store. And the immigrants keep coming. In the past two decades Atlanta has seen spirited growth in its Asian and Latin-American communities. Related restaurants, shops, and institutions have become part of the city's texture. There are tons of great bed and breakfasts in the city of Atlanta, our city guide will help you find the best bed and breakfasts. You may have a hard time deciding what to do in Atlanta, but we make your decision easy. 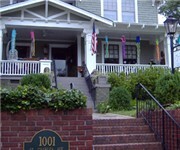 65 Sheridan Dr NE, (404) 233-8520 - European style bed and breakfast inn in Buckhead, Atlanta, Georgia. Affordable rates, romantic intimate atmosphere. There are plenty more bed and breakfasts in Atlanta. See all bed and breakfasts in Atlanta Georgia.